“I’m so damn glad we put this update episode together and had a chance to catch up with four of our favorite previous guests. It was truly magical. I mean Lee Presson sang “Pennies From Heaven” to us acapella so ’nuff said. We started the episode off with “Renueducation” from the new album “Howdilly Twodilly” by the savage Nedal band- Okilly Dokilly. Then spent a half hour chatting with the Head Ned himself about the band’s new album, lineup change, and coming tour. Next, we chatted with our pal Benjamin Jaffe, after we played a little “Susan The Cat”, about his life since he has gone solo and what the future holds for this once Honey Honey guitarist. The next lead in song was “Goody Two Shows” by the dynamic Chicago powerhouse duo known as White Mystery. We chatted with Miss Alex White about her 11th year with the band and how after a decade of being musical conquerors what it’s like to shift gears and move into a new phase of the White Mystery experiment. And finally bringing us home is that Dapper Director of all things swing and jazz Mr. Lee Presson (lead-in music “Boogie Man” performed by Lee and his fabulous Nails. On this segment, we talked about everything from the state of the world to the state of current music. And rounding up the show is a Musical Osmosis update about our coming documentary about the southern MD music scene and a little beloved venue called Wilmar’s Park. With the help of Dan Harsha from The Southern Maryland Guitar Guru’s Show, we bounced some ideas off of each other on air so all you fans can hear the creative process unfold. 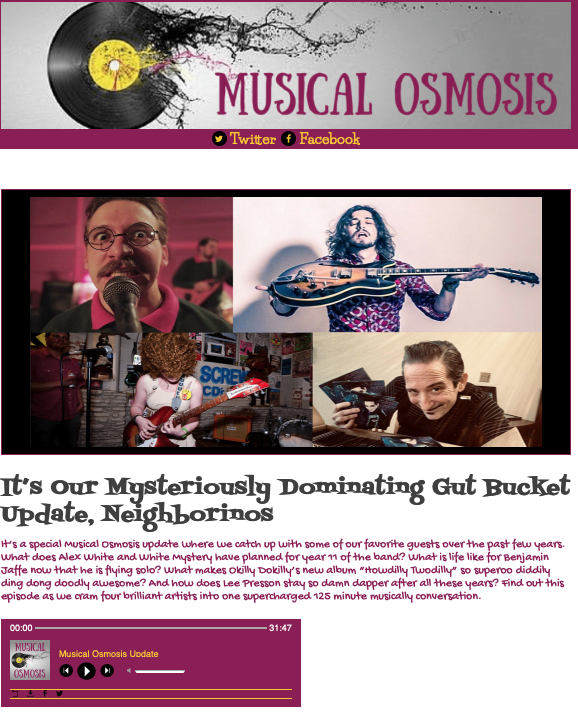 Over 2 hours of fun, music, and updates from your pals here at Musical Osmosis. Enjoy! PS. The show ends with White Mystery- “Power Glove”- now you can enjoy.